Last week I talked about how to choose plants for a more sustainable landscape, and now it's time for some sustainable hardscaping ideas. Hardscaping is basically any hard or paved area in the landscape or any inorganic material that covers the soil. This could include pavers, bricks, mulch, etc. I mentioned how choosing Illinois native plants is a great idea for a more sustainable landscape and in terms of sustainability, choosing local hardscape materials is just as important. When purchasing materials, we often don't think about how far something has travelled to get to where we're buying it from. Instead of purchasing mulch that has travelled from another state to get to your local garden center, possibly think about getting mulch that was chipped locally. Whatever you decide to use as a hardscape material, be sure to research the maintenance requirements prior to purchasing. Your overall goal should be to try and use the least amount of virgin materials as possible and reuse and reinvent as much as possible. Think about the safety of the materials as well though. One should avoid creosote-impregnated railroad ties, and some treated woods when growing edible crops nearby for instance. 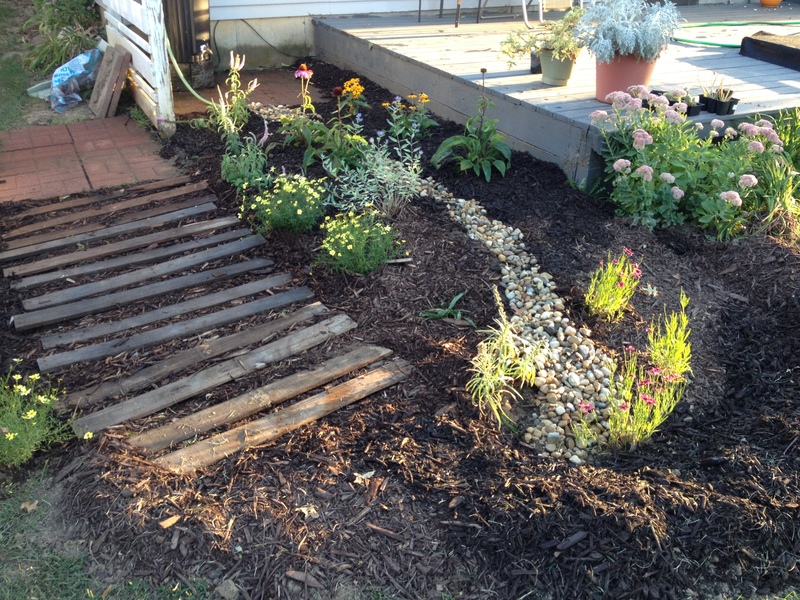 The above picture shows the reuse of pallet wood as a pathway in my landscape. Water runoff from large paved areas like our driveways can cause a big strain on our storm water runoff systems and cause a variety of pollutants, like leaking oil from our vehicles, to run off into our streams, lake, and rivers. To alleviate this added stress to our storm water systems, think about putting in some porous hardscape materials instead. Permeable pavers or even pavers where you can plant grass in the middle of the pavers are available from a variety of sources. Check back next week for more sustainable landscaping topics!